Lama Zopa Rinpoche with Tenzin Phuntsok Rinpoche, Bodhgaya, India, December 2018. Photo by Ven. Roger Kunsang. Order the 2019 LPP Calendar from the Foundation Store! The Path to Happiness Is Priceless … and Reduced! 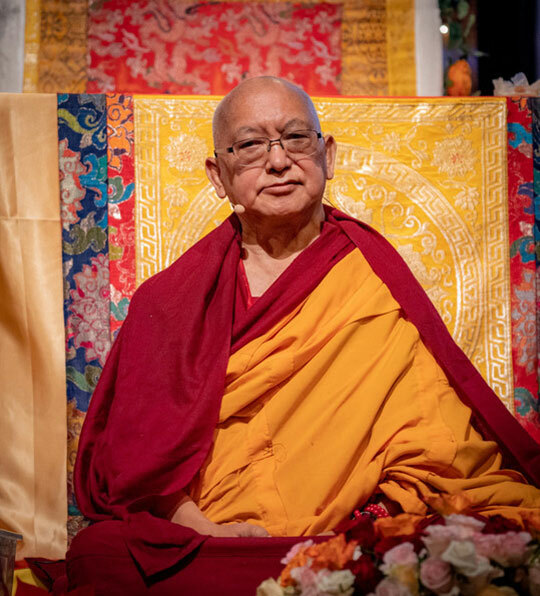 Lama Zopa Rinpoche teaching in Germany, November 2018. Photo by Harald Weichhart. 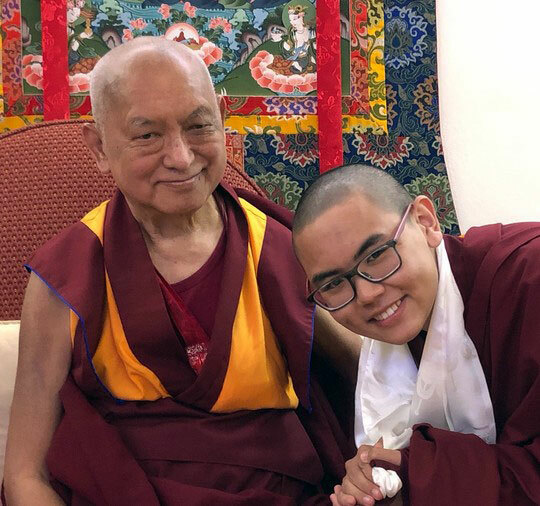 Find new additions to Rinpoche’s teaching schedule for 2019: Latvia, Spain, Singapore, Russia, and India. You can always find recordings of Rinpoche’s recent teachings at Rinpoche Available Now. 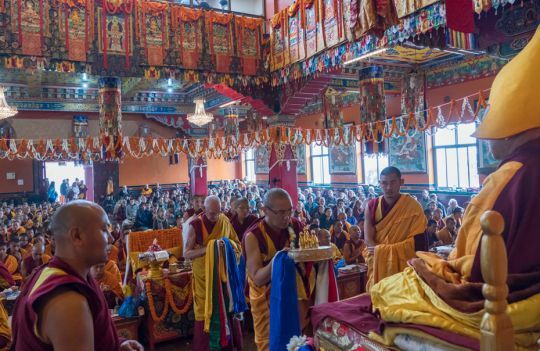 Long life puja for Lama Zopa Rinpoche at the conclusion of the 51st Kopan Meditation Course, Kopan Monastery, Nepal, December 2018. Photo by Ven. Lobsang Sherab. Lama Zopa Rinpoche petting Shamatha the cat who had jumped up onto Rinpoche’s throne, Kopan Monastery, Kathmandu, Nepal, December 2018. Photo by Bill Kane. 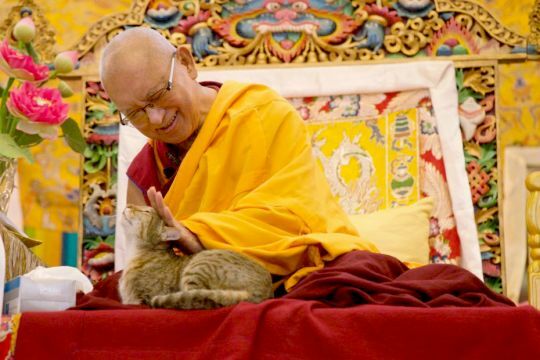 Lama Zopa Rinpoche recently gave advice to a student who had asked how to benefit a very sick twenty-one year old cat. Read the advice for ideas on how to benefit your own pets. Merit Box practitioners and coordinators – the time to turn in your accumulated Merit Box offerings is now! Offerings turned in between now and March 31 will be awarded as grants to support Dharma projects in need of help. For over 17 years, Merit Box funds have been disbursed to worthy projects such as building repairs at centers, retreat sponsorships, creating new stupas and statues, Dharma book publications, and more. You can submit your offerings online here. 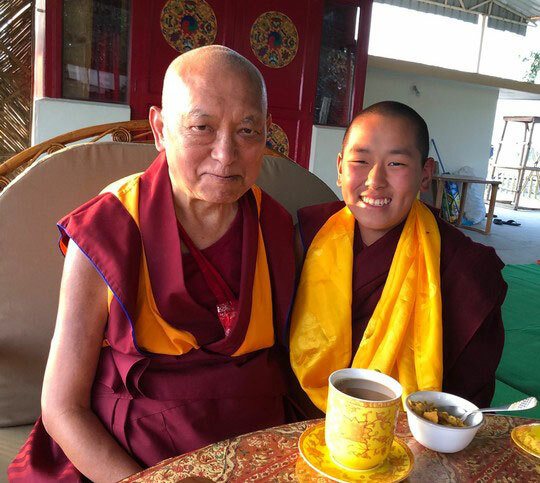 Lama Zopa Rinpoche with Ribur Rinpoche, Bodhgaya, India, December 2018. Photo by Ven. Roger Kunsang. The Liberation Prison Project’s 2019 calendar has just arrived and is available to order today. Save on shipping by ordering the PDF format. By purchasing this calendar, you are directly supporting the Liberation Prison Project, an international FPMT project that works with Dharma students in prison. 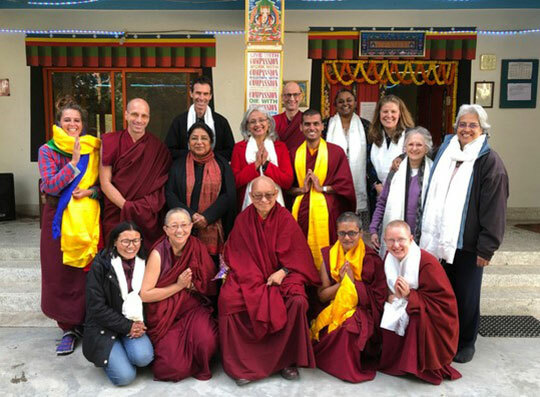 Lama Zopa Rinpoche with participants in the FPMT India National Meeting, Root Institute, Bodhgaya, India, January 2019. Photo by Ven. Roger Kunsang. “[If] People come to FPMT centers and they see that people there are more kind to others; not proud, not arrogant, not angry, not that old personality from beginningless rebirth, not that, [but showing] Dharma qualities: good hearted, kind, the same to uneducated people, educated people, young, old, everyone, like His Holiness has respect to everybody, educated, uneducated, poor, rich – like that. For FPMT that’s very important, then people are so happy to come back again and again to the center. Losar (Tibetan New Year) falls on February 5, 2019. Rinpoche’s advice on what centers, projects, and services should do on Losar is in the Practices to be Done on Special Days part of the Collected Advice from Lama Zopa Rinpoche section of the Affiliates Area. During the 2018 European Regional Meeting, Lama Zopa Rinpoche was asked about offering the 5 Pillars – read Rinpoche’s response in The Five Pillars of Service section of the Affiliates Area! Rinpoche recently advised all FPMT hospice services that they should display thangkas or posters of different pure lands. Find all Rinpoche’s advice for hospice services in the Centers, Projects, and Services section of the Affiliates Area. Applications for 2019 Merit Box grants are being accepted between now and March 31. As explained in the Fundraising Guidelines section of the Affiliates Area, the Merit Box is one of the ways in which International Office facilitates your center, project or service’s fundraising goals. Also see above – Merit Box collection time is also now! 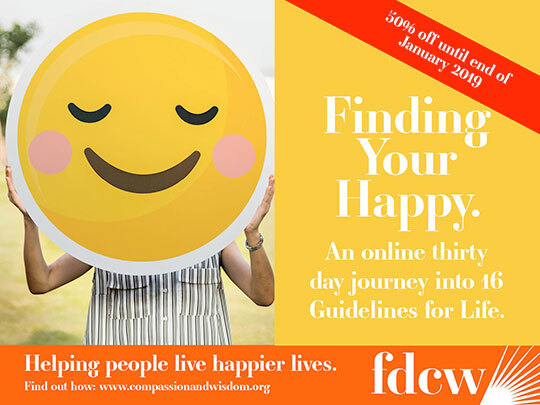 FPMT international project, The Foundation for Developing Compassion and Wisdom (FDCW) are offering their unique online course Finding Your Happy: An online 30 day journey into 16 Guidelines for Life for half price until the end of January. This course is a 30-day journey toward a new level of understanding of yourself, and others, through the 16 Guidelines. By thinking about universal principles which we encounter every day, noticing our patterns of thinking, speaking and acting, and getting to grips with how our minds work through mindfulness and self-inquiry, we can find lasting happiness. Get more information, and sign up to the course. Would you like to spend your days in a very meaningful way? Have a look at the regularly updated meritorious opportunities to offer service as a volunteer or as paid staff in FPMT centers, projects, and services around the world. Newly added: Root Institute, India is looking for a spiritual program coordinator; and Kopan Monastery is looking for qualified school teachers.